The Nike SB Zoom Stefan Janoski sneakers have a streamlined, low profile with a smooth suede, canvas, or leather upper design. The perfect skateboarding shoe, these durable sneakers are complete with Zoom Air cushioning for low-profile impact protection and a herringbone pattern at the rubber outsole. 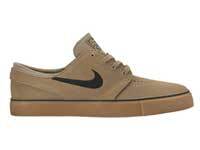 Nike SB Zoom Stefan Janoski "Red Stone Tan"
This is the classic design that I find most preferable. The zoom air cushioning is a real treat for my feet, and is mostly the reason why this is my brand of choice. The tones are very simple but pleasant to look at. Suede is one of the textures that I like on my shoes. For me, it just has some inexplicable degree of class. The design seem old-school, simple and comfy – just the way I like it. Any of the color available here will definitely match most of my wardrobe. Awesome! Dang! That black leather is the bomb! 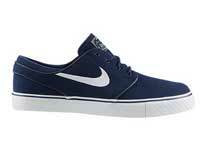 I’m no skateboarder but I’ve always bought Janoskis cuz they’re so cool for outdoors. Five stars for this one! Zoom Air cushioning is the best! No other shoe can have that comfortable and lightweight feel. Glad there are new ones for this season. Red Stone Tan looking very nice! Perfect blend of style and elegance. I’d like to wear those shoes to a hipster concert and make all the crowd jealous. Good shoes are empowering and I think these kicks take the cake. Wow I love the design. It’s very classy. The flat lace suits the shoes. Is this really for skating? I feel like this is more of like for parties or something. I like the brown one with the green nike logo on it. And then it should have green laces on it too. Very cool shoes. I like the look of this, the leather kind of shoes! I wonder what is the Inspiration for this model? 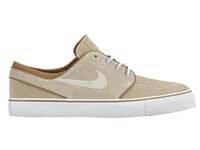 I mean Janoski sounds like a jewelry than a shoe. But that aside I like the blue jeans one. Does it come with a model that does not need lases? If it does I will love to buy it. Never the less it is perfect. OMG! I can’t believe it’s here already. Red Stone Tan is my favorite so far. Take them out skating or wear them for casual occasions, it’s all up to you. They feel comfy, look good, and got great grip on most surfaces. My friends and myself bought ourselves a pair each a few years back. The only complaint I’ve ever heard from the guys is that it isn’t good for those with a wide foot. Get a pair when you want skate shoes that’s clean, lightweight, skateable, and low-profile. You want your game to do the talking, after all!! My advice to anyone who’s buying one is to go for a pair that’s true to size. No size allowance or going half a size smaller if you want it to fit just right. 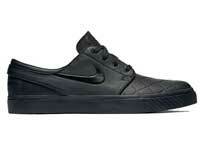 Take it from someone who’s been wearing Janoskis ever since! Comfy lookin’. I would wear it.. Looks pretty good and simple. Ohh I want this! Looks pretty good! Hopefully I can find something like this for my brother’s birthday!